Larry Patrick Photography: Enough Interest? 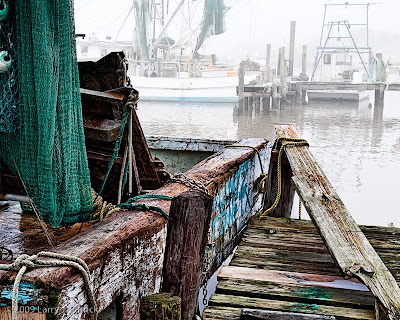 When I saw this scene I really liked the textures of the foreground versus the foggy, blown-out background. I started to shoot the image in HDR but then decided that I would normalize the overall scene and the contrast would be eliminated. I decided to properly expose the foreground so I used a spot meter on the net area and expose accordingly. The basic question I have about this image is simple: Does the subject of the boat and the contrast with the background create a photograph that has impact? Camera settings: Nikon D3, Nikon 28-70mm f/2.8 at 50mm shot at ISO 200, f/13 and 1/60th of a second. Photoshop—used nik Color Efex Pro tonal contrast to add contrast to highlights, mid-tones and shadows of the boat and dock. I think it works. My eye goes straight to the green net and color in the foreground. Then my eyes go to the background and briefly look around. I do get drawn back to all the color and detail in the foreground pretty quick though. I like it. To me it probably more closely reflects what you saw. I have always heard that the eye goes to the brightest part of a photo, but my eye keeps looking for more details in the boat and dock. I think the foreground has enough interest to carry the photo. Nice shot Patrick! I really like the composition and the contrast (exposure and tonality) between the foreground and background parts of the image. High impact photo, no. Good photo that gets your attention and holds it, yes. Not very good. A weak photo with little impact. I like the simple details of the boat, but my eye is pulled to the background, maybe a little too much. I do not think the foreground, although interesting, is sufficient to make this a high impact photo. To me, there is a disconnect between the foreground and the background that makes it hare for me to get my mind around the image. One part of me likes this photo while another part does not like it. You have made me think on this one. There's so much about the foreground that wants to lead you out to the background, but I don't think the background has that much of a payoff. With the fog, there's not a whole lot out there visually to keep you there. But I really like the textures you have in the foreground. Lots of People, Doing What?